Jeffrey Barg may only be in middle school, but he has already written and released four apps in the iTunes App Store. Two of them are puzzle apps. Both apps appear to be simple puzzle. However, neither one is very simple in the end. The idea for my first game, Nim, was given to me when my Math Teacher … showed my the ancient chinese game of Nim (I think mostly in an effort to stop me from annoying him . That weekend I programmed the basic game and in the next few weeks I had a finished app, which I soon afterwards submitted to the App Store. The board looks simple enough. You start with three rows of sticks consisting of 3, 5, and 7. You take turns with either the computer or another person removing sticks from the board. The object is to get your opponent to take the last stick. You may remove as many sticks as you want on your turn, but you may only remove sticks from one row at a time. It takes playing the game quite a few times to figure out how to force your opponent to take the last stick. This app is for the true puzzle lover. NIM is $0.99 in the iTunes App Store. 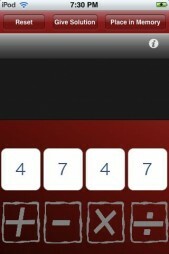 The second app Jeffrey released is called Number 14. It was released in December and is a game of manipulating numbers. Each round of the game you are given 4 random numbers between 1 and 9. Your job is to perform simple computations with these numbers (addition, subtration, multiplication, and division) and end up at the number 14. 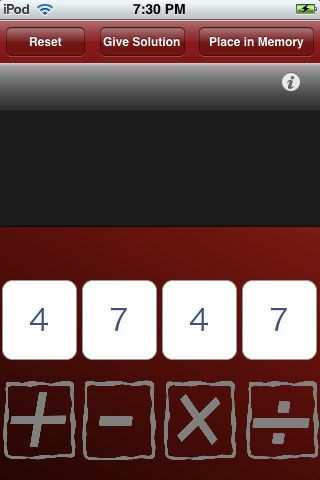 The app times you so that you can see how long it takes to solve each puzzle. If you end up at another number and want to try again, you can reset the screen. 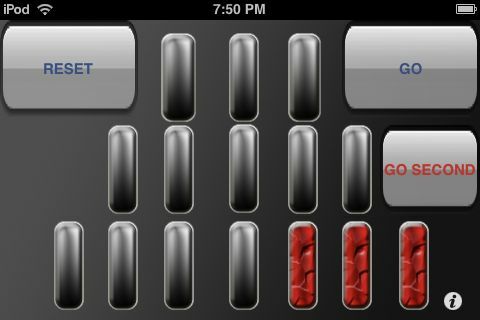 If you end up on another number time and time again and decide to give up, you can tap the “give solution” button. A possible solution will be given to you, ending the frustration. Maybe it is the way my mind works, but I found the puzzles in this app much easier to solve. This puzzle is fun for those who are good at math or like numbers. Number 14 is $1.99 in the iTunes App Store. Both of these apps present a challenging puzzle in a clean, neat interface. My hats off to you, kid. I have been a fan of Apple products for ages and they never let me down, great customer service, reliable hardware and good customer service. The latest and the greatest from Apple is the iPod Touch, it’s like a laptop but much smaller and cheaper, what makes the iPod Touch awesome are all of the Apps that available out there. I don’t look at my iPod Touch as just a media player anymore, it’s also the best most useful gadget i have even owned. My Wife loves it as well and my kids won’t put the darn thing down thanks to all the Apps for Kids available out there. Before the iPod Touch my Kids were playing their Nintendo DS Lite all the time and they have not touched the DS ever since i bought the Touch, it’s been months.